PG – 13 | 2 h 3 min | Drama, Romance | 25 June 2004 A poor yet passionate young man falls in love with a rich young woman, giving her a sense of freedom, but they are soon separated because of their social differences. 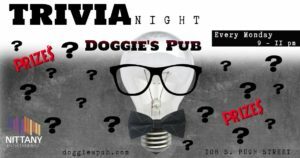 Test your knowledge at the pub! Hosted by Nittany Entertainment. 5$, $10, $20 prizes.